31 May - 2 Jun. Situated on a lake, this luxury bed & breakfast is within 6 mi (10 km) of Solitary Island Aquarium, Diggers Beach, and Big Banana Fun Park. 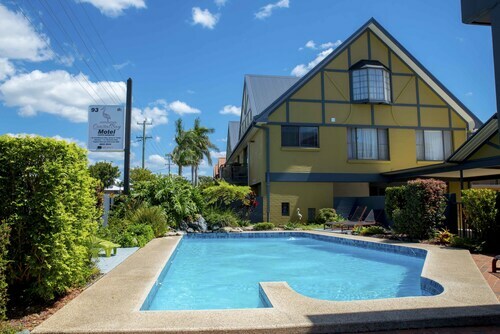 Whether you are looking for a family holiday or a peaceful weekend escape, we have a Coffs Harbour hotel to suit every price and holiday need. 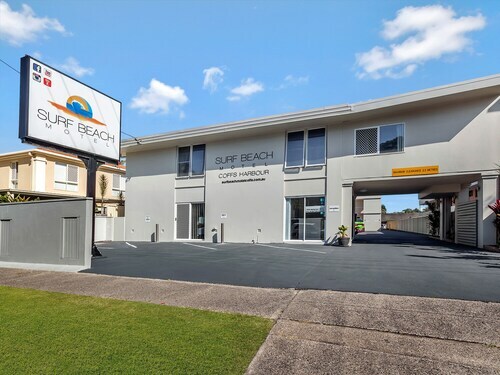 Our wide range of Coffs Harbour accommodation is perfect for exploring all the area has to offer, including whale watching and deep sea fishing, surfing, national parks, multi-cultural restaurants and cafes and crafts markets. Coffs Harbour, located almost halfway between Sydney and Brisbane, is on a picturesque spot on the New South Wales’ coast where the Great Dividing Range meets the South Pacific Ocean. Whether you want to catch a wave, build a sandcastle or have a beachside BBQ, our Coffs Harbour accommodation is the perfect base for enjoying the area’s golden beaches. Coffs Harbour’s most popular beach is Park Beach, which is patrolled by the local Surf Life Saving Club and provides great conditions for surfers. For calm swimming conditions, visit Jetty Beach where the Marina’s breakwall protects the waters from the ocean swell and the famous Coffs Harbour Jetty extends from the beach. There are many other beaches in the area providing great swimming, surfing, fishing and picnic spots. Our hotels in Coffs Harbour are great for visiting all the local attractions. Visit the Kiwi Down Under Farm, an organic fruit farm, specialising in kiwi fruits or check out the Big Banana to visit Australia’s first ‘Big Thing’ and sample more local produce. Experience a little taste of Holland in Coffs Harbour at the Clog Barn, which features a miniature Dutch village complete with working windmills and model railway. Touch dolphins and seals and watch them perform at the Pet Porpoise Pool or see hundreds of live Australian butterflies and an outdoor maze at the Butterfly House. If you want to get your hands dirty and learn more about Australia’s history, visit George's Gold Mine and pan for gold. Love music? Coffs Harbour is host to the Coffs Harbour International Buskers and Comedy Festival. Discover new musical talent at this festival, which is held over eight days during the September school holidays. Bring the family for a great day out! The Bellingen Jazz Festival is another famous event, attracting jazz lovers from all around New South Wales during the third weekend of August each year. If you are looking to relax in beautiful surroundings try our Coffs Harbour resorts. For more options nearby view our Nambucca Heads accommodation or view all NSW North Coast accommodation. 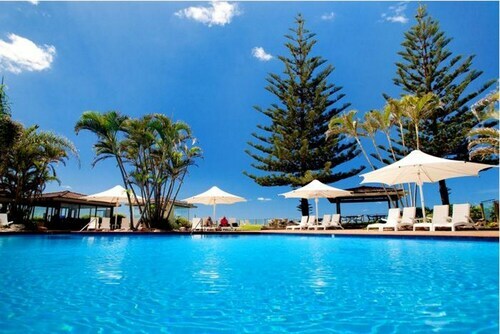 No matter what you’re after, book our hotels in Coffs Harbour and enjoy a holiday in paradise. Need insider tips on must-see attractions in Coffs Harbour? Check out our Coffs Harbour travel guide! How Much is a Hotel Room in Coffs Harbour? 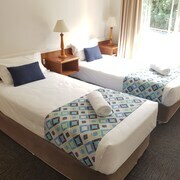 Hotels in Coffs Harbour start at AU$69 per night. Prices and availability subject to change. Additional terms may apply. This property was ok, close to the beach - but sadly no view from our room. We all enjoyed the large heated pool and spa areas as well as the tennis courts, and the staff were fantastic. The kids especially had a great time. Only downside was the beach isn’t suitable for swimming for young kids (too steep) and it’s a car ride to get a good coffee. The front reception staff were very friendly and helpful. As I understand the motel is under new management but you wouldn’t have known, check in was so easy. The room was so lovely and clean. The position of our room was the best and so quiet. Would definitely stay again.